Finance Minister Bill Morneau speaks to members of the media as Prime Minister Justin Trudeau looks on at a press conference on tax reforms in Stouffville, Ont., on Monday, Oct. 16, 2017. The Liberal government is revising its proposed changes to small-business tax rules in a way that Finance Minister Bill Morneau says will better target Canada's wealthiest investors. The government intends to allow incorporated businesses to generate up to $50,000 a year in passive-investment income – equivalent to a return of 5 per cent on $1-million in savings – before controversial new rules aimed at curbing the use of corporations for personal savings would be applied. Mr. Morneau said this will ensure middle-class business owners are not affected by the change, which the government estimates will apply to less than 3 per cent of the 1.8 million Canadian-controlled private corporations. The proposal to raise taxes on passive investments held in incorporated small businesses was the most controversial element of a sweeping tax plan Mr. Morneau released in July for public consultation. It would have discouraged the use of incorporated small businesses as a vehicle for making passive investments that are unrelated to the company – such as buying shares of other firms. Wednesday's announcement, which the minister made at a company in New Brunswick, is aimed at addressing small-business owners' concerns that the original proposals would hurt their ability to save for economic downturns, short-term parental or sick leave, or retirement. The revision received tentative praise from some of the most vocal critics of the initial proposals. "That is good news," said Shawn Whatley, president of the Ontario Medical Association. "But at the same time, we need to see more details. I am pleased to see that it appears as though the federal government has moved and that we've been successful in advocating that at least some of these unfair changes are going to be adjusted." A similar view was expressed by Dan Kelly, president of the Canadian Federation of Independent Business. "It is certainly progress," he said. "The best part is that the government is starting to recognize that passive investment plays an important role. I think it's way too soon to say whether the overall package is going to do the trick to restore business confidence and trust with the government." Mr. Morneau said the proposed new threshold will ensure the changes affect only the government's stated target: very wealthy people who use small-business structures as a vehicle for paying less tax. "We understand that many, many small businesses are using their corporations to save for the future by making passive investments," he said. "For the vast majority of corporations, the overwhelming majority, this isn't a problem. But in a very small number of cases, it gives wealthy people an unfair advantage over and above everyone else." The government says savings that are re-invested in the business would be unaffected by the federal proposals, but the CFIB views that assurance as "murky." Mr. Morneau had argued that small business owners should take advantage of existing programs – such as registered retirement savings plans and tax-free savings accounts – as their primary vehicle for saving. Business owners responded that strict withdrawal rules for RRSPs make that option unattractive. The other main aspects of the July proposals included measures aimed at limiting the ability of small business owners to "sprinkle" income to family members who are not directly involved in the business as a way of paying less tax. Another proposal would restrict the conversion of dividend income into lower-taxed capital gains. On Monday, Mr. Morneau and Prime Minister Justin Trudeau revised the definition the government will use to determine whether income sprinkling is reasonable and can be exempt from the new rules. It also said the sprinkling provisions would not apply to the lifetime capital-gains exemption. 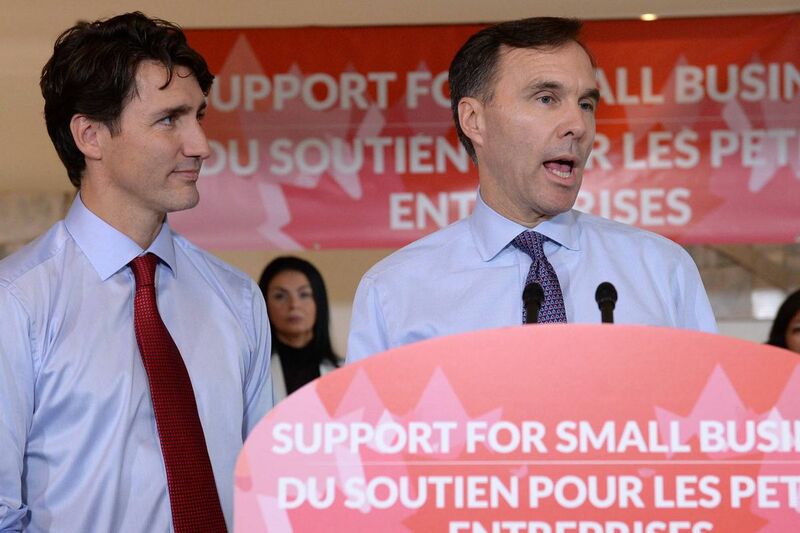 The Liberals also announced on Monday that the small-business tax rate – which applies to the first $500,000 in active business income – will be reduced from 10.5 per cent to 9 per cent by 2019. The Parliamentary Budget Officer has estimated that cutting the rate to 9 per cent would lead to a drop of about $800-million a year in federal revenue. Mr. Morneau said the money raised by the new restrictions on small businesses will help pay for the tax cut. He repeated on Wednesday that the income-sprinkling provisions are expected to raise about $250-million a year in new federal revenue. He said the passive-investment provisions will raise multiples of the $250-million figure, but that it is too early to provide a firm estimate. The government said its proposals related to passive investment will be released as draft legislation at the time of the 2018 budget. Lindsay Tedds, an associate professor who specializes in tax policy at the University of Victoria, said Wednesday's announcement addresses the original proposal's "draconian" restrictions on holding passive investments in a business. "I find it difficult to think that anybody would have any negative reaction to this," she said. "This is a fairly good compromise. It's a very high limit. My only concern is with the whack-a-mole problem. … This clearly incentivizes these corporations with incredibly large portfolios to move off-shore." Some critics of the original proposals dismissed Mr. Morneau's revisions. "They've applied a very small bandage to a very flawed package," said Allan Lanthier, a former chair of the Canadian Tax Foundation and a retired senior partner of the consulting firm Ernst & Young. "Investments are already leaving the country. They're going to continue. The outflow is simply going to accelerate." Conservative finance critic Pierre Poilievre said his party is still studying Mr. Morneau's announcements, noting that it took time for experts to highlight the problems with the initial plan. "They've admitted that their original proposal was just as bad as we claimed, by virtue of the fact that they're backpedalling on it," he said. "So we will look upon this and other Liberal tax proposals with the suspicion that they deserve." NDP MP Nathan Cullen said his party will review Mr. Morneau's announcements, but questioned their purpose. "What's happening this week feels like damage control," he said. "And my concern is that [when] policy rolls out in that context, you're unsure if it's good policy or not because the government is on its heels, backing away."